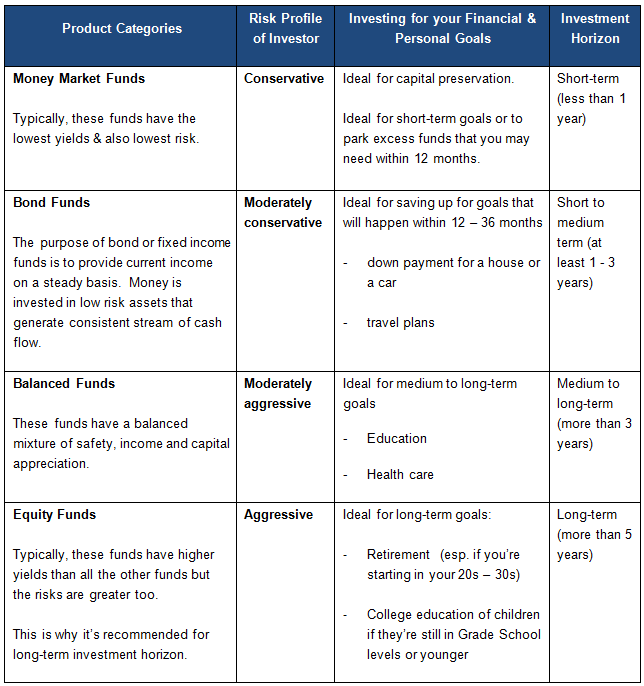 There are mutual funds that range from conservative to aggressive. This refers to the level of risk associated with each product type based on where the pooled funds are invested. There are no guaranteed returns in mutual funds. It is very important that you know where your money is invested. Most mutual funds require a modest minimum initial investment of as low as P5,000 and minimum additional placements of only P1,000. Diversification helps minimize volatility in asset prices by balancing risk across various outlets. Shareholders of mutual funds, particularly those with small amounts of capital, instantly achieve this benefit of diversification as mutual funds are invested in a wide range of securities. Mutual funds are managed by professionals who analyze and closely monitor market developments that would impact the portfolio of a fund on a daily basis. Even with a small investment, investors may afford the services of a fund manager by owning shares of a mutual fund. They are easy to invest in. No need to monitor, track and fuss over any details. Let the expert Fund Managers do the work for you. Given the size of mutual funds, transaction costs are often reduced as these funds could negotiate for lower brokerage and commission fees. As such, the pooling of funds results in a more cost-efficient approach to portfolio construction. Mutual fund investments are highly liquid and investors can always redeem the shares. For redemption settlement periods, please click here.